James McAvoy and Bill Hader are currently in talks to star alongside Jessica Chastain in next year’s “It: Chapter Two,” according to an individual with knowledge of the talks. 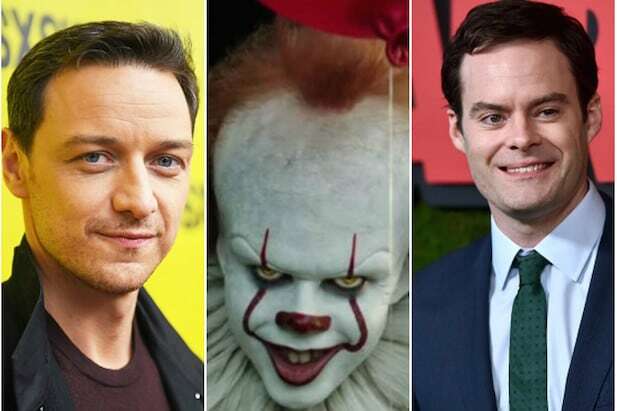 If he signs on, McAvoy will play Bill Denbrough, the leader of the band of social outcasts who vanquished Pennywise the Clown in last year’s “It.” Taking place over a quarter-century later, the adult Bill is now a successful author who must face his past when he discovers that Pennywise has returned to Derry, Maine. Jaeden Lieberher played Bill in the first film. Hader is in talks to play Richie Tozier, the class clown played by Finn Wolfhard. Now a successful DJ as an adult, he too learns about Pennywise’s return and goes back to Derry to fulfill the promise that he and his friends made to each other at the end of the first film. Chastain has already signed on to play Beverly Marsh, the lone girl of the group and Bill’s childhood sweetheart. Bill and Beverly kiss at the end of “It,” but in the time that has gone by, Beverly has moved away and married to an abusive husband. “It: Chapter Two” will see the first film’s director Andy Muschietti and screenwriter Gary Dauberman return, along with the kids from the original film who will reappear in flashbacks. Barbara Muschietti, Dan Lin and Roy Lee are producing with Seth Grahame-Smith and David Katzenberg as executive producers. The film will start production this July with release scheduled for Sept. 6, 2019. McAvoy appeared last year in the spy action film “Atomic Blonde” and M. Night Shyamalan’s “Split,” the latter of which is getting a sequel, “Glass” that will see McAvoy reprise his role as the possessed Kevin Crumb. McAvoy will also return for his fourth performance as Dr. Charles Xavier in “X-Men: Dark Phoenix,” which was pushed back to a Valentine’s Day 2019 release for reshoots. Hader appeared last year as the robot Alpha 5 in “Power Rangers” and stars in the HBO series “Barry.” Both he and McAvoy are repped by UTA. “It” was the biggest surprise of the box office last year, opening to $123.4 million last year and grossing $700 million worldwide. That made it the highest grossing horror film of all-time, unadjusted for inflation.